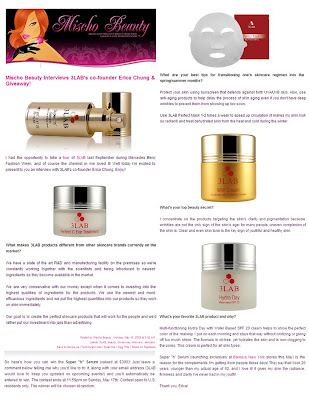 What makes 3LAB products different from other skincare brands currently on the market? What are your best tips for transitioning one's skincare regimen into the spring/summer months? What's your favorite 3LAB product and why? Multi-functioning Hydra Day with Water Based SPF 20 cream helps to show the perfect color of the makeup I put on each morning and stays that way without oxidizing or giving off too much shine. The formula is oil-free, yet hydrates the skin and is non-clogging to the pores. This cream is perfect for all skin types.Super "h" Serum (launching exclusively at Barneys New York stores this May) is the reason for the complements I'm getting from people these days! They say that I look 20 years younger than my actual age of 52, and I love it! It gives my skin the radiance, firmness and clarity I've never had in my youth! No, no, thank YOU MischoBeauty.com!! !